Home » What's Your Opinion poll results: Is Heinrich valid? In an informal online poll in August 2011, readers were asked to apply experience to theory and deliver their own verdicts on H.W. Heinrich, a pioneering thinker on accident prevention. As you reduce the base of observed at risk behaviors, it takes longer to get to the number of at-risk behaviors that correlate with having a serious injury, therefore, there is less potential for that serious injury to occur in the operation. For a large population (certainly not just a Company or Region) the theories make intuitive sense. Once an event takes place,the determination of severity is beyond our control. There are so many factors that cannot be controlled once the event takes place; thus it is important to keep the triggering event from ever occuring. years of experience has shown me that the ratios are valid. According to Dan Peterson, Heinrich's study was never validated. I trust Dr. Peterson much more than I trust H. W. Heinrich. Based on my experience, the accident triangle seems to have some basis in fact. I believe that the unsafe acts ratio is invalid because almost every incident has issues of conditions, behavior and management responsibility. First it makes logical sence. Second, other studies have shown similar results. Third, the accident triangle is an effecive training tool to get the attention of employees to report unsafe act and conditions before something bigger happens. Yellow light Yellow light Red light BOOM If you watch driving habits described above long enough you can quantify Heinrich. Of course, there are random events also that are not predictable but can be anticipated, such as a lightning strike. It really believe for the most part it's true, however it can't be used as a standard for all workplaces. Hazardous environments yes, office environments "maybe not". Just my thought. I have seen many people try and dispute this theory but time and time again research proves it to be correct. The numbers may not be exact, but I think anyone would be hard pressed to argue that unsafe acts won't eventually lead to very serious incidents. While the nature of work in many places has changed since Heinrich's time, there are other precursors or conditions which give validity that there is a high ratio of indicators that preclude workplace incidents with injuries and/or property damage. We now know his "theories" were based on faulty or more likely incomplete analysis of available data, or his misinterpretation of the data. Theories filtered thru his flawed, linear, mental models on human behavior and causation. They are based on studies done on coal workers. 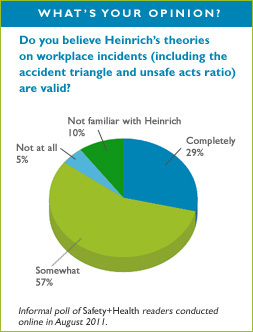 I believe Heinrich's theory is valid with companies that do not have safety programs or are just starting safety programs. Once a program has been in place, producing some results, the theory ratio becomes altered and invalid. It does provide a theory, but reporting of minor incidents is critical. I believe the principles are valid, but the ratios will vary depending on the environment. People do stupid stuff all the time and survive. The more you do it the more your chance of getting damaged goes up. I find the concept very plausible, but only take the numerical ratios as a general guide. Hisresults were skewed by industry reporting and assumptions as to the root cause of the accident. The base of his pyramid is correct in that there are always a multitude of warning signs (near misses)prior to an accident. it tends to mislead the reader into thinking that everything at the bottom could end up at the top - and that is not correct. Always room for error but behavior is nearly all the reasons for incidents that take place. I think even in an unsafe condition a person can still act in a safe manner. Some incidents are caused by a person's behavior, usually in an effort to avoid discomfort or to save time or effort. I do not believe a valid survey was conducted to come to the conclusion of the study. I believe there are amny more close calls, near misses, etc, that only lead to more catastrophic events, we simply do not identify those. There is no emperical evidence to support his theory that I am aware of. What's your opinion on OSHA’s main role? Is sustainability part of your employer’s EHS strategy?